Would you like individual instruction in a specific technique or to experiment in a new medium? Would you like to take a short class with your family or friends? Does Pratt’s course schedule conflict with your schedule? If so, Custom Classes may be the right option for you. Choose from the following ready-made packages, developed from some of our most popular custom class requests. 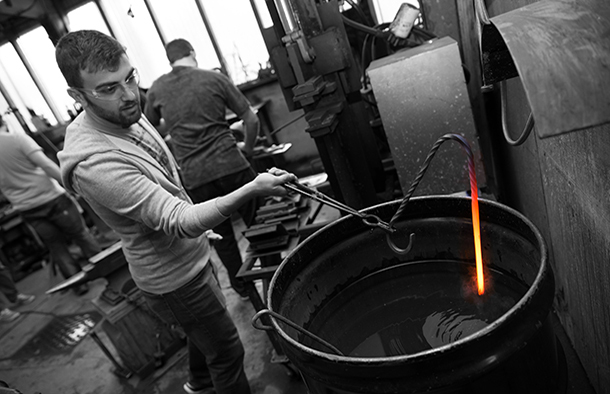 Up to four students can be accommodated in all classes except for glassblowing. The price listed is divided by the number of students in the class. If you’re interested in arranging one of these packages, please email info@pratt.org. Explore screenprinting - a popular, hands-on method for creating layered and dynamic prints. Twirl glass over a flame and shape into colorful, wearable glass beads! This is a great opportunity to work with hot glass on a small scale. Glassblowing is addictive! Try it for the first time at Pratt and make your own glass paperweight and float. Step back in time and use a hand-operated letterpress to create your own prints! Learn to hand-set metal type, lock up a type form, ink up, set up, and operate the press. If you are interested in arranging a Custom Class, please review this fact sheet, and complete the student profile located below. It may take up to two weeks to coordinate the lesson so the sooner we hear from you, the better! We look forward to having you at Pratt!